I am jumping on the blogging bandwagon...for one night only. Mummy extraordinaire to C, and wife to H.
Mums to be, look away now, perhaps just take a little peek, I actually hope to strike a good balance of witticism, cynicism, schmaltz and sincerity. So I am not going to lie, motherhood is tough! It's not quite the heart melting, fairytale scenario I had hoped for, it has pushed me to the very limit and at times sucked the very life from me, and that was just the birth! No amount of preparation can prepare you...and believe me I prepared. 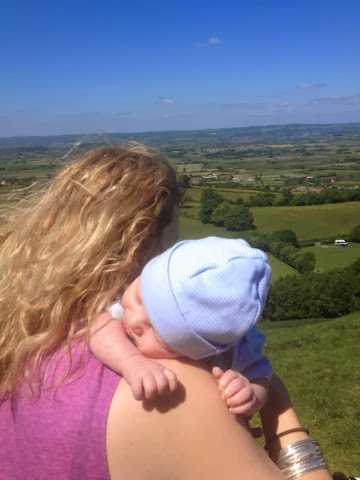 I am now officially a member of mum club and one distinguishing feature of mum club is that you have a right to raise an eyebrow or two at some unsuspecting single woman who talks with a rosy naivety about how wonderful it must be to be a mum, and surely giving birth cant be that bad can it?! Yes it is wonderful and yes it is that bad! (in my experience) this is just my experience. I honestly wonder whether I have been suffering from post traumatic stress (PTS) as I still have nightmares that I am pregnant again and being asked to give birth and in the dream I just say, "no I can't", over and over again. What is interesting as well is that you think the birth stories that you hear are bad when you are pregnant but believe me they get worse after you have had the child...then the horror stories really come out of the woodwork! In the early weeks a day feels like a year, and it was a joke between my friends that the only word that seemed to describe how we felt was 'overwhelming'. People would say make the most of it as the early weeks go by so quickly, they are only this small for such a short time. From 10-12 weeks it does get easier, but when you are in the situation of first time mother with a two week old waking every hour for a feed you honestly think, I am not sure I can make it to tomorrow let alone next week! I have observed that some women take to motherhood better than others. Some people have easier babies than others, some people like being at home, with their baby for company. I need more - there, I said it! My baby isn't enough for me, I like work, adult company, intellectual stimulation, I like my own hobbies and time, I am still working on not feeling guilty for that. But I do know I am a good mum and that I love my son and he loves his life, his dad, his childminder and the other people who care for him from time to time such as nana and grandpa. Who knows whether having mummy at home 24/7 is a better or worse set up but our set up works for us. I know these earth mother blogs have the best of intentions but they can make you feel bad because you think, 'well that woman is coping why am I not on cloud 9?!' Same with the birth, when C was finally pulled out, I reflected, am I the only woman who at that moment was in truth as worried about 'what the hell just happened to me' than staring into the eyes of my new born baby boy. So why do we go through it, I have asked myself this question and have struggled for answers but today I am inspired. Our children are our best teachers, and teach us about the many hidden facets of ourselves. They teach us limitless love, patience, and frustration. They test your relationship and shake it to its very core. I had a child because I wanted to be a mother, I wanted to nurture a life and to raise a beautiful child that will grow to be a beautiful adult who will love and give back to the world. This is my mission now, to ensure he has the best start possible, this is my greater good and together with my partner in crime/life we will put aside our trivialities and difficulties in pursuit of this greater good.